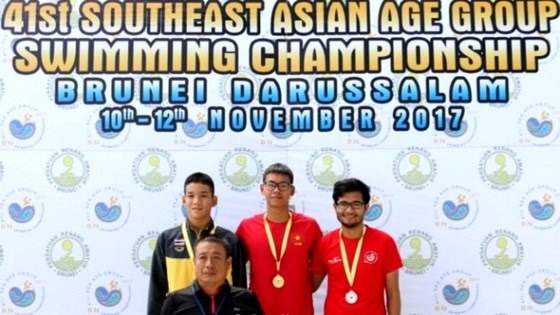 HÀ NỘI — Việt Nam topped the Southeast Asian (SEA) Age Group Swimming Championship which concluded at the Hassanal Bolkiah National Sports Complex Swimming Pool in Brunei yesterday. Việt Nam earned a total of 51 golds, 27 silvers and 13 bronzes to take the lead in the medal tally. On the last day of competition, Vietnamese swimmers bagged 19 golds, six silvers and six bronzes. This year’s event attracted the participation of 235 swimmers from nine countries. They competed in three age groups of 13 and under 13, 14-15 and 16-18. Việt Nam sent a total of 27 swimmers to the three-day meet including 15 males and 12 females. The youngest member from the Vietnamese team was aged 13. Notably, 15-year-old Nguyễn Hữu Kim Sơn set a new record with a time of 3:56.46s in the boys’ 14-15 400m freestyle, eclipsing the old time of 4:01.01s set by his compatriot Nguyễn Huy Hoàng in December 2015. Sơn also made a new SEA Age Group record after clocking a time of 2:06.47s in the 200m medley category, surpassing a five-year record of 2:06.50s previously set by his compatriot Trần Duy Khôi in June 2012.